As more time progresses, it wouldn't be surprising if the bulk of your feedback is nothing but spam. What has just happened to you is something that happens to every single person and company online that provides a simple way for people to submit data. You are now the target for automated scripts / tools known as spambots. Their only purpose in life is to scour the internet and find avenues where they can send their spam. Your contact form is one such avenue! A CAPTCHA is nothing more than a simple test. The only question to ace is deciphering the text that is shown in the weird format and to type them in the text field provided. To a human, these letters are somewhat easy to decipher. 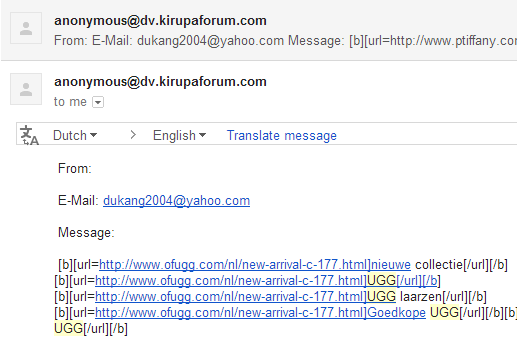 To a spambot, these letters often make no sense. By using this simple test, you can differentiate between humans and spambots. Someone who can pass this test is probably a human. Someone who cannot pass it is probably a spambot...or just really unlucky with the words they received. Now, you can probably see how differentiating between a human and a spambot can help you decide whether your contact form should submit some data to you or not. There are many free CAPTCHA implementations you can use. In this tutorial, you will learn how to take the popular reCAPTCHA service and use it to protect your contact form from spambots. You Shall Not Pass...Unless You Have a Contact Form! As a prerequisite, you should have a PHP-based e-mail contact form and know how it works. If you do not have a contact form (or can't afford a contact form), a court-appointed contact form will be provided for you in the form of the E-mail Contact Form tutorial. Create the contact form and learn why it works the way it does. This knowledge will help immensely when getting your CAPTCHA to work properly. Once you've filled out the form, hit the Send! button. If you submitted the form by typing both of the words incorrectly, you will see an error page asking you fill out the form again. If you typed the words correctly, submitting the form will show you a confirmation page indicating the feedback was sent. This is all pretty simple behavior. Now that you have an idea of what you will be creating, the subsequent sections will turn that idea into working PHP and HTML. For me, the domain is www.kirupa.com. Make sure to change this value for the domain your contact form will be living on. If this value doesn't match the domain your contact form is being used or tested from, the reCAPTCHA validation will not work. There are two pieces of information here that you need to know about for implementing the reCAPTCHA service on your site - the Public Key and Private Key. These two values are important, and you will need them in your code later on. Keep this summary page open so that you have easy access to them for later. Of course, you can always revisit the reCAPTCHA site and see these values, so don't panic if you accidentally close this page later. Ok, now that you have your reCAPTCHA account setup for your domain, it's time to get to the fun stuff. The next step is to show the reCAPTCHA box in your contact form. This involves two steps. The first step is to add a PHP library to your server that contains a lot of the reCAPTCHA functionality. Once you have done that, you then need to modify the HTML document your contact form is in by adding some inline PHP code that brings the reCAPTCHA code to life. A part of the reCAPTCHA functionality actually lives on your server, so you need to download a single file from Google and then upload it. Go to the reCATPCHA Downloads page and download the latest PHP library. You'll see a handful of files, but the only one we care about is recaptchalib.php. On your server, in the same directory as your contact form's HTML document or in a location that you can easily access from there, go ahead and upload this recaptchalib.php file. 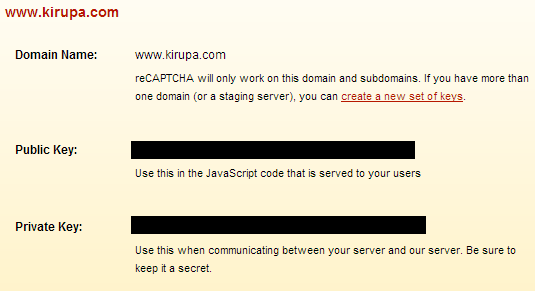 Ok, do you remember when I said there are two steps needed to get the reCAPTCHA test to appear? Well, there are actually three steps. 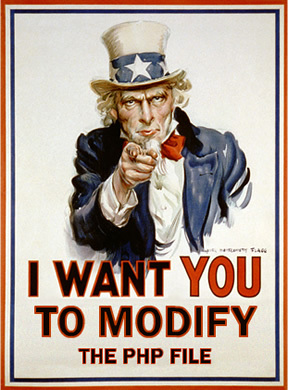 Just before you get to modify the HTML, you have to do one additional very important thing. The HTML document your contact form is living in needs to be able to run inline PHP scripts. If you don't know what that means, don't worry. Here is a simple test - does your contact form HTML document have a file extension of PHP? If so, you are set. Go ahead and skip over to the next section. If your contact form page has an extension of HTM or HTML, rename the page to have an extension of PHP. For example, if you followed my contact form tutorial, you would rename contactform.htm to contactform.php. If you are more knowledgeable with configuring your server, there are other ways of making an HTML document execute inline PHP content without renaming a page to have the PHP extension. The end result is what matters, so if you have your own ninja way of doing this, you should use it. I am not a server wizard, so if you can share your technique, I (and others!) would appreciate it. We are finally at the step that we've all been waiting for. 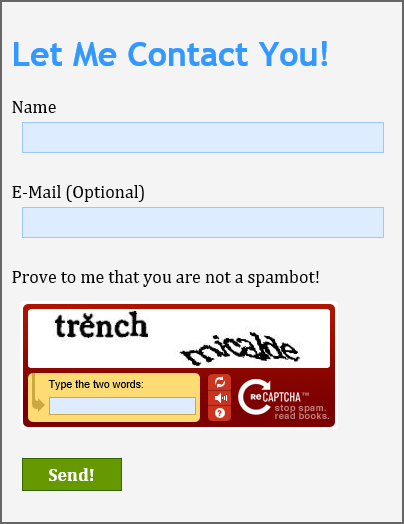 It is time to actually display the reCAPTCHA test in our contact form. If you have friends and family around, call them over to look over your shoulder - that's how awesome this is going to be. The snippets I provide in this section and the next are from Google's reCAPTCHA documentation with only very little modification by me. In the first line, you are making a call to the recaptchalib.php file. If that file isn't in the same directory as your contact page, make sure to update the path to the location the file is in. The second line is important. For the $publickey variable, replace the values inside the quotation marks with the public key displayed in the reCAPTCHA Account Summary page. Don't use the private key here - you'll get a chance to use that shortly. If you are seeing something similar to what I am seeing, then you are almost done! The last thing to do is to modify the PHP script that receives this form data to validate what you placed into the reCAPTCHA form. Right now, even though you see the reCAPTCHA box and can type things in, no validation is being done when you submit your form. You can type in complete jibberish and your form would submit just like it always has. Let's fix that in this section. Your form will have the action attribute set to the path of the PHP file that handles everything on the server. In the case of this contact form, that PHP file is mailer.php. It is in this file our code for validating the text typed into reCAPTCHA will be done. // if CAPTCHA is correctly entered! Just like before where you had to insert your public key, in the variable named $privatekey, provide the private key value that you have from your account summary. Make sure your private key is inside quotation marks. Now, let's talk briefly about using this snippet as part of your contact form. My advice is for you to take this snippet in its entirety and then backport your existing PHP code for handling your form data to work inside it. The condition ($resp->is_valid) for this if statement evaluates to true if the data entered into the reCAPTCHA box checks out. Inside the true block, the one with the comment "great success!" is where your code for sending the form data will actually live. This code will be largely based on the existing code you may have had in this file before having to deal with the reCAPTCHA validation. // ...and away we go! Notice that inside the if statement, all of the code for retrieving the data from my form fields as well as mailing that data can be found. The best part is that all of this code was just copied and pasted from what I had earlier. If you test your contact form now, you'll see the behavior you defined for both correct as well as incorrect CAPTCHA entries. In my example, I navigate people either to a confirmation.htm page if the values are entered correctly or to captcha_incorrect.htm if the values are entered incorrectly. You can do whatever you want for either of these cases! Well, that is all there is to adding a reCAPTCHA test to a contact form. It isn't the most simple of things to do, but the payoff is well worth the effort. While there are some spambots that use good OCR (Optical Character Recognition) technology to decipher the text and pass the test, the vast majority fail the test very easily. If you want some fun/background reading, read the reCAPTCHA Wikipedia page to learn more about its origins and how each time somebody fills out a reCAPTCHA form, they are helping digitize books, newspapers, and other non-digital things.